We’re wishing Larry David a happy birthday, even though he hates The Happy Birthday Song. The man wouldn’t even sing for Ben Stiller. Like most things in life, it’s a whole “to do.” This is essentially the core of Larry’s humor. His witty observations about the nuances of life and rules of society are the basis for arguably two of the best comedy programs ever made. Seinfeld, which he co-created with Jerry Seinfeld, revolutionized the sitcom. At a time when sitcoms were churning out an A story and a short B story, Larry was packing in four intertwined character arcs into one episode. Jerry, George, Kramer, and Elaine were integral parts of each episode. If you dissect individual episodes, you would find that a lazier show runner could have easily created four whole episodes out of one show. Each of those episodes would still be funny, but that’s not Larry’s style. This is what puts Larry above the rest. His show will forever be a part of popular culture. One can compare everyday situations to episodes of Seinfeld, as if the show was a handbook for life. Even quoting Seinfeld is a part of life for some. Here are some of the more popular phrases from the show, in case you’ve been living under a rock. 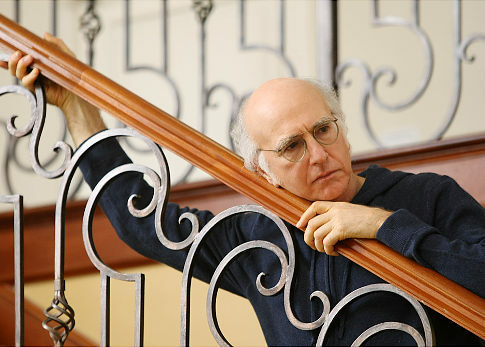 After Seinfeld, Larry was given a little more freedom with his own HBO show, Curb Your Enthusiasm. Again, breaking barriers. His loose, single camera improv approach to comedy was refreshing and new. We no longer needed the three camera sets and canned laughter to let us know when it was safe to laugh. Plus, Larry brings himself in front of the camera, and he’s actually “pretty, pretty” good at it. The plots and subplots of the episodes are established in an outline written by David and the dialogue is almost all improvised. Much like Seinfeld, the subject matter in Curb Your Enthusiasm often involves the intricacies of daily life and problems of a conventional society. Larry David always has the need to express his feelings of such problems, which almost always leads him into awkward situations. The situations range from absurdity to pure bad luck, and yet we somehow relate. Check out some of these hilarious moments from the show. After eight seasons of Curb and nine seasons of Seinfeld, there’s no telling where Larry can go next. One thing we can tell you, is the man has made quite a pretty penny on his brilliant comedy creations. But, his unique character can never be swayed by money. He is a true individual with an unmistakable personality that can only be, Larry David. Tweet us your favorite moments from Seinfeld and Curb Your Enthusiasm @NYFA!